The wise Greek philosopher, Heraclitus, observed more than 2500 years ago that change is the only thing that is certain. 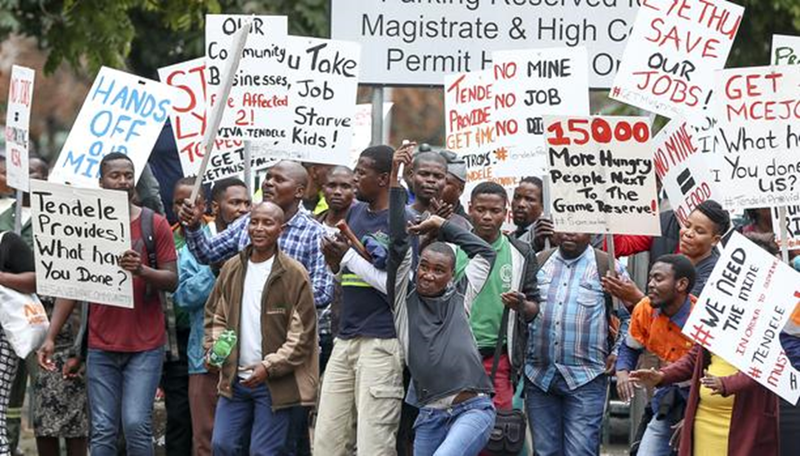 On 24 August 2018, placard-waving workers from Tendele Coal Mine in Somkhele, stood outside the Pietermaritzburg High Court protesting against our application to close the mine for being non-compliant. On 1 April 2019, eight months later, these same protesters closed the mine themselves! Who would have thought this possible? Some people considered the reported closure an April Fool’s hoax. Undoubtedly, the mine would have been happy if this had been so, but it is fact not fiction. The workers closed the mine because of grievances relating to underpayments in their salaries – in some instances, as much as R10,000 a month. Significant differences in salaries being paid to people doing the same job have also created dissatisfaction. These arise from Tendele’s non-compliance with union rates. Negotiations with the CCMA are ongoing to try and resolve the situation. How ironic that the workers achieved what our High Court application failed abysmally to do. Not only did we lose our case but Judge Seegobin ordered us to pay the mine’s legal costs. Our High Court case was challenging Tendele for its non-compliance but, in our case, it related mainly to no Environmental Impact Assessment and no waste management licence. These should surely be mandatory, particularly for such a polluting activity right next to the historic Hluhluwe iMfolozi Park, established over 100 years ago as a sanctuary for the last remaining White Rhino on the African continent. The honourable Judge thought otherwise. While Heraclitus is right that change is inevitable, Supertramp, a superb English rock band from the 70s wrote a song called “Some Things Never Change”. This would provide a good title for the long litany of non-compliance associated with Tendele since it started its operations in 2007. For seven years, the mine operated without a valid water use licence. The mine also exhumed and relocated hundreds of graves without necessary permits and reneged on its agreed compensation to families for the exhumation of the remains of their ancestors – a very serious matter in Zulu culture. The mine has taken the property of hundreds of people without compensating them for their land, only for their homes, arguing that they live on tribal land that belongs to the Ingonyama Trust Board. It turns out the mine is wrong, and that people in tribal areas are entitled to be paid out for their land or relocated to a place that is similar to the land they have had to vacate. In August 2018, the South African Human Rights Commission released its report on mining affected communities, a document that includes numerous human rights abuses perpetrated by Tendele. Earlier in 2018, ActionAid conducted an audit of Tendele’s Social Labour Plan and discovered glaring discrepancies between what the mine had committed itself to do and what it has actually done. This is likely to result in court action against Tendele. Compensation claims are also in the process of being compiled against the mine. And so, the list of non-compliance goes on…. So who benefits from Tendele? Clearly the workers are not benefitting as they should, hence the closure of the mine on 1 April. Somkhele residents are definitely not benefitting, particularly those directly affected by the negative impacts of Tendele mine. The general complaint is that the majority of residents are much worse off now than before Tendele started mining in 2007. This complaint is valid and runs counter to the falsely held belief and narrative that mines uplift and develop communities. This is not true. So, who are the beneficiaries of Tendele’s millions? There are the usual well-paid CEO and top mine managers, and the shareholders when stock markets are strong, but it appears the main beneficiary is an unidentified entity, referred to in Tendele’s Mining Works Programme as “Royalties-Tribe”. From July 2018 to June 2019, it is tabled that the “Tribe” would be paid over R9-million; the government R3.5 million; and Mine Health and Safety Regulations just over R8-million. For the same period, it was anticipated R35,281 would be paid in rates and taxes. Go figure this out. Judge Seegobin’s punitive judgement made in the Pietermaritzburg High Court case against GET, Sabelo Dladla and the Mfolozi Community Environmental Justice Organisation (MCEJO) is on appeal. We are waiting for a date, probably in August, for our appeal to be heard. We are confident we will win, which opens the way for us to take our case to the Supreme Court in Bloemfontein, which we also anticipate winning. A recent article in the Business Day confirms strong support from the highly respected Centre for Environmental Rights (CER) for our case. They see our application as setting an important precedent for the mining sector to comply with environmental requirements set out in the National Environmental Management Act (NEMA). Currently many mines in South Africa are operating without the necessary authorisations. Regarding the costs order, CER’s program head for mining, Catherine Horsfield, expressed grave concern that if this judgement is allowed to stand, it could have “a chilling effect” on civil society’s important watchdog role of bringing legal challenges that are in the public interest to the courts thereby defending our constitutional rights and protecting the environment. At the same time, MCEJO is calling for a review of the dismissal of its appeal by Minister Gwede Mantashe, who approved the 222 km² mining right granted to Tendele mine in 2016 for 30 years. This matter will be heard in the Pretoria High Court. The date is still to be set. The mining right incorporates the area north of Tendele’s current mining operations for the full length of HiP, as far north as Centenary gate. The initial application was for 34 km² and the specialist studies also cover this area, which amounts to less than 5% of the total area. The Minister deemed this and the consultation process adequate. Meanwhile none of the affected communities nor Interested and Affected Parties (IAPs) like MCEJO, GET, MACUA, WAMUA, Womin, groundWork, the Wilderness Leadership School, the Wilderness Action Group, WESSA, Wildlands or local tourism operators were informed about this application until GET’s attorney, Kirsten Youens, discovered the mining licence and brought it to everyone’s attention. On 1 May 2014, GET initiated the Save Our iMfolozi Wilderness (SOW) campaign to support the Fuleni community in its opposition to the proposed Ibutho Coal mine. Fuleni is a tribal reserve on the south-eastern boundary of the iMfolozi Wilderness Area, across the Mfolozi river from Somkhele. This area is held sacred by the Zulu people because it was where King Shaka grew up as a boy and incorporates the hunting grounds reserved for the Zulu Kings. After an intense three-year battle, Ibutho Coal seemed to disappear off the scene. Then, in June 2018, Imvukuzane Resources sent out notice that they had applied to prospect the Fuleni Reserve. This was met with a strong response from the IAPs and the Fuleni residents who are steadfast in their resolve not to allow mining on their land. Nothing further has happened and after several months we discovered that Ibutho Coal is challenging the Department of Mineral Resources for rejecting their application on grounds that they cannot adequately mitigate the impacts their mine would have on the iMfolozi Wilderness area. Effectively this means Imvukuzane’s application will have to wait until this matter has been resolved. One wonders how the Imvukuzane mine will be able to mitigate its impacts, which are likely to be similar. Meanwhile a couple of interesting development projects are being initiated by Fuleni residents demonstrating that the people are taking control of their own future. There is a well-managed community goat breeding project that ensures the carrying capacity of allocated land is constantly monitored and not overstepped Linked to this is a goat meat processing plant being established by a group of enterprising young women from the area. So positive change is definitely taking place….proving Heraclitus correct. There is nothing permanent except change. Posted in Fuleni, Save our iMfolozi Wilderness, Somkhele and tagged Centre for Environmental Rights, Fuleni, Imvukuzane Resources, Somkhele, Tendele Coal Mine.